Thattai recipe, thattai murukku. A tempting and crispy snack made with rice flour usually around Krishna Jayanthi and Diwali. A tempting and crispy snack made with rice flour usually around Krishna Jayanthi and Diwali. Thattai or thattai murukku is quite easy to make. 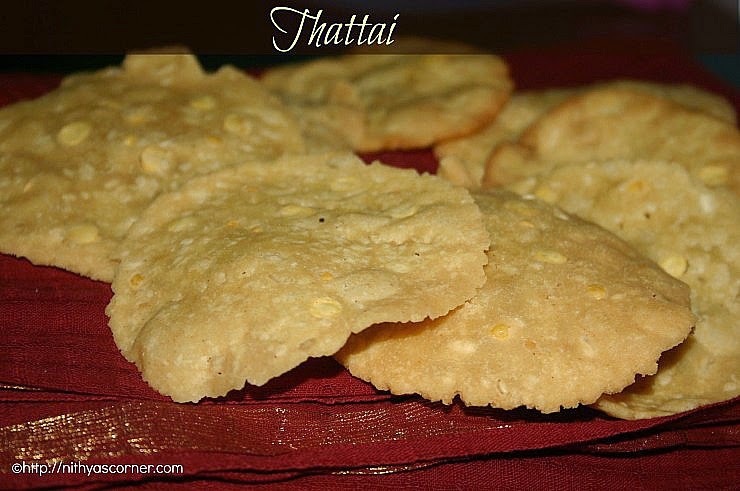 I got this thattai recipe from my friend which is very simple and easy to follow. Usually, I make thattai for Diwali and Krishna Jayathi and share it with my friends. They always loved it. I love thattai murukku so much especially the ones sold in Adyar Anandha Bhavan. 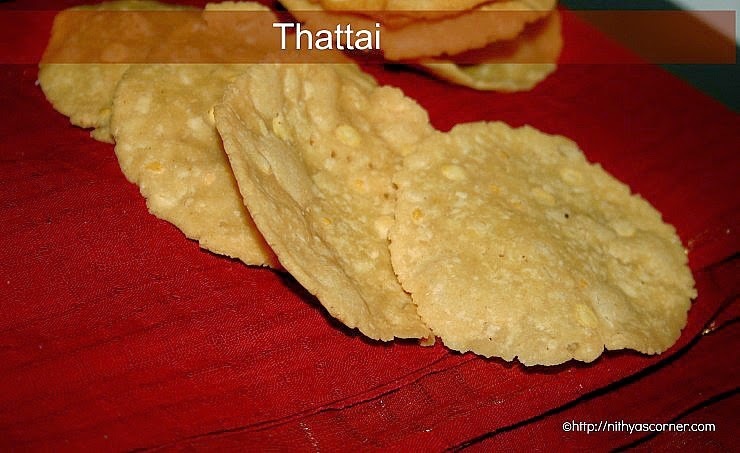 Even in my school days, if my dad asks me what snack I want, I would always say thattai first. After moving to USA, I did not find tasty thattai sold anywhere. Few years ago, I tried this thattai recipe for the first time. Since then I make thattai murukku very often at home. For all those who think how to make thattai or wonder that making thattai is very difficult, follow this recipe. You will get crispy and delicious thattai. Thattai recipe. A tempting and crispy snack made with rice flour usually around Krishna Jayanthi and Diwali. Soak channa dal and urad dal in water for 1 hour. Do not skip this step. In a bowl, add rice flour, urad dal flour, roasted gram dal flour, asafoetida, red chilli powder, salt, butter, sesame seeds and the soaked dals well. You can also add roasted peanuts and curry leaves to further enhance the taste. Add water little by little to make a smooth and soft non sticky dough. Make small gooseberry sized balls. Meantime, keep the dough covered so that it does not dry out. Take two zip loc covers or square plastic sheets and grease it with few drops of oil. Keep a ball on one of the zip loc cover and close the balls using the other zip loc cover. Using a flat bottomed bowl, press the ball into a flat round shape. You can also do this with your fingers. Using a flat bottomed bowl makes the work of getting the round shape easier. Meantime, heat the oil. It should be really hot. After flattening with the bowl, flatten some more with your fingers to make it thin and even. Just before frying, using a fork or toothpick, you can prick the Thattai here and there if you sense its not cooked evenly. Carefully take the Thattai off from the zip lock cover and drop it in hot oil. While cooking, cook it in medium low flame. When you drop thattai in the oil, it will get cooked on one side and rise to the top. At this point, flip it over and cook for some more time (medium-low heat) until the bubbles completely stop. After the bubbles stop, cook for 1 more minute to make sure thattai has cooked completely. Drain thattai in paper towel and cool it down. Repeat the same for all the balls. Do not add butter more than required because at the time of frying, excess butter will disintegrate Thattai. The whole dough may go waste. You can also add 2 tbsp of coconut. It gives a good flavor. You can also microwave curry leaves for 2 minutes to make it crispier and add it to the dough. Butter can be replaced with ghee and oil. Using roasted gram flour is optional. If you add excess water, once Thattai is fried, it will lose its crunchiness. The more thinner thattai is, the more crispier will it be. If you are making a large batch, then pressing thattai using a flat bottomed bowl is a wise idea as you will be done in minutes. Also, make thattai in batches by keeping the dough covered. While you make thattai using one batch, keep the other Thattai batch covered. You can also use a puri press to flatten thattai. If thattai breaks while dropping it in oil, then the consistency is not correct. Add more flour, reduce the water and adjust the measurement of the ingredients accordingly. Frying on low flame will yield very oily thattai. When thattai is done, it will look pale orange in color but when it cools down, it will turn to its natural golden color Store thattai in an airtight container only after thattai cools down completely otherwise it will lose its crunchiness. 1. Soak channa dal and urad dal in water for 1 hour. Do not skip this step. In a bowl, add rice flour, urad dal flour, roasted gram dal (pottukadalai) flour, asafoetida, red chilli powder, salt, butter, sesame seeds and the soaked dals well. You can also add roasted 3 tablespoon peanuts and curry leaves (as desired) to further enhance the taste. Add water little by little to make a smooth and soft non sticky dough. 2. Make small gooseberry sized balls. Meantime, keep the dough covered so that it does not dry out. Take two zip loc covers or square plastic sheets and grease it with few drops of oil. Keep a ball on one of the zip loc cover and close the balls using the other zip loc cover. Using a flat bottomed bowl, press the ball into a flat round shape. You can also do this with your fingers. Using a flat bottomed bowl makes the work of getting the round shape easier. 3. Meantime, heat the oil. It should be really hot. After flattening with the bowl, flatten some more with your fingers to make it thin and even. Just before frying, using a fork or toothpick, you can prick the thattai here and there if you sense its not cooked evenly. Carefully take the thattai off from the zip lock cover and drop it in hot oil. 4. While cooking, cook it in medium low flame. When you drop thattai in the oil, it will get cooked on one side and rise to the top. At this point, flip it over and cook for some more time (medium-low heat) until the bubbles completely stop. After the bubbles stop, cook for 1 more minute to make sure thattai has cooked completely. Drain thattai in paper towel and cool it down. Repeat the same for all the balls. Now, thattai murukku is ready! Butter gives crispiness. Do not add butter more than required because at the time of frying thattai, excess butter will make thattai disintegrate. The whole dough may go waste. Do not add butter more than required because at the time of frying, excess butter will disintegrate thattai. The whole dough may go waste. You can also add two tbsp of coconut. It gives a good flavor. You can also microwave curry leaves for two minutes to make it crispier and add it to the dough. Butter can be replaced with ghee and oil. Using roasted gram flour is optional. 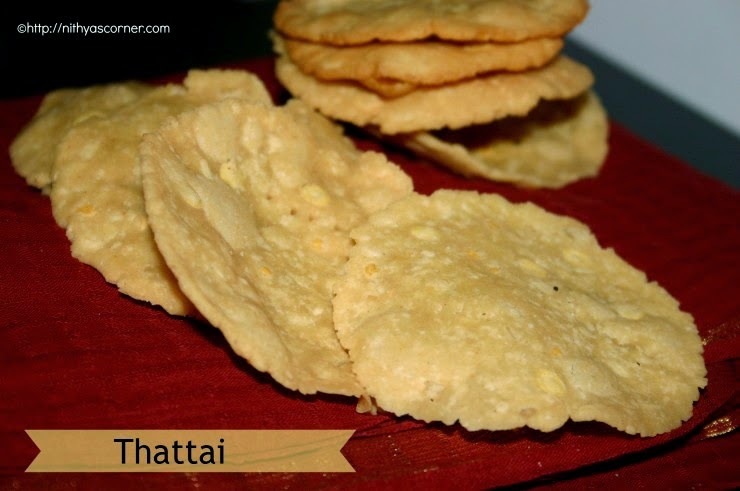 If you add excess water, once thattai is fried, it will lose its crunchiness. If thattai breaks while dropping it in oil, then the consistency is not correct. Add more flour, reduce the water and adjust the measurement of the ingredients accordingly. Frying on low flame will yield very oily thattai. When thattai is done, it will look pale orange in color but when it cools down, it will turn to its natural golden color. Store thattai in an airtight container only after thattai cools down completely otherwise it will lose its crunchiness. The more thinner thattai is, the more crispier will it be. If you are making a large batch, then pressing thattai using a flat bottomed bowl is a wise idea as you will be done in minutes. Also, make thattai in batches by keeping the dough covered. While you make thattai using one batch, keep the other thattai batch covered. You can also use a puri press to flatten thattai.